Back in 1996, Bill Gates published an essay called “Content Is King.” He predicted how important content would become over time. More than 20 years later, that prediction is being affirmed. Interest in content marketing is rising by leaps and bounds and it has become a focal point for nearly all marketers and businesses. How much does content marketing cost today? 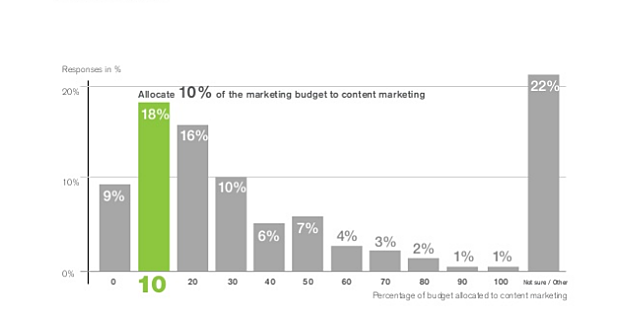 In a 2014 LinkedIn survey, 18% of companies said they allocated 10% of their budget to content marketing. Compare that to just 4% saying they spend 80% or more of their marketing budget on content and a whopping 22% that were not sure. For one, it shows that many companies were still under-spending on content marketing. But even worse, it shows that the majority of marketers were unsure about their content marketing budget. How does that stack up with today's content marketing spending? According to CMI, 22% of B2B companies plan to spend between 1 and 9% of their total marketing budget on content and 19% plan to spend between 10 and 24 percent. The recent CMI survey also shows that 6% of marketers plan to spend 75% of their marketing budget on content and just 3% plan to spend nothing on content. Perhaps most surprising, though, was the 28% percent of participants who said they were "unsure" how much they'd spend on content marketing. So, what gives with this increase in folks who aren't sure what they're spending on content marketing? Does it mean the future of content marketing is shaky? No. Does it mean that content marketing isn't growing? Nope. Does it mean that content marketing budgets (and marketing budgets in general) are in flux? Comparing the 2014 and 2017 surveys, you'll notice that despite the growth in uncertainty around content marketing budgets, the number of people who spent nothing on content actually dropped. In fact, according to CMI, 88% of B2B companies in North America are currently using content marketing. Additionally, CMI reports that 51% of B2B marketers say they'll increase content marketing spending in the next 12 months. That means the growth in uncertainty about content marketing budgets can be attributed to an increase in people starting to invest in content but not knowing exactly how much to spend. Now that you know what other companies are spending on content marketing, it's time to figure out how much to spend for your own company! How does content marketing fit in with your marketing and business goals? To get started, it's critical to make sure your business can even benefit from content marketing. For most, content will undoubtedly be helpful (and even necessary). But, there are some companies that won't really benefit much from increased content production. Once you've decided that your company can leverage content, it's time to develop a content marketing strategy. In fact, only 64% of companies with a documented content strategy have a dedicated content marketing budget. Whether you have a content strategy in place or not, it's very important to establish a strategy with concrete goals before setting your content marketing budget. To do that, you'll need to assess your goals, mission and other considerations that could impact how you leverage content marketing. Once you find a place in your marketing mix for content, you should establish an expected return on investment, just like you would with an advertising strategy. 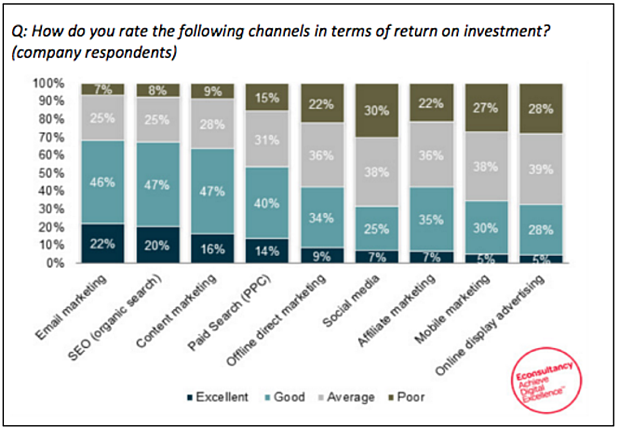 What is the ROI for content marketing compared to other channels? If you have a content strategy in place but you're not sure what sort of ROI to expect, you'll want to establish a way to measure content performance going forward. The best way to do this is to assign a dollar value for actions in your content. That could mean an ebook download, a click to a sales page, an actual conversion from your content or all of the above. 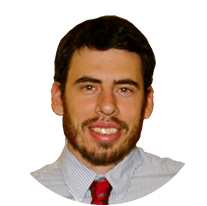 You should assign values to all of the actions that could occur on your site. Keep in mind that even if you set up values for all of the possible actions on your site, the results are still just giving an estimated value. That's because a lead may get introduced to you thanks to a piece of content online but end up calling your business for the actual conversion. So, just remember that while these metrics are very helpful, they rarely provide the full picture. When marketers were asked to rate marketing channels in terms of ROI, content marketing landed in the top three, just behind email marketing and SEO (which are often overlapping). 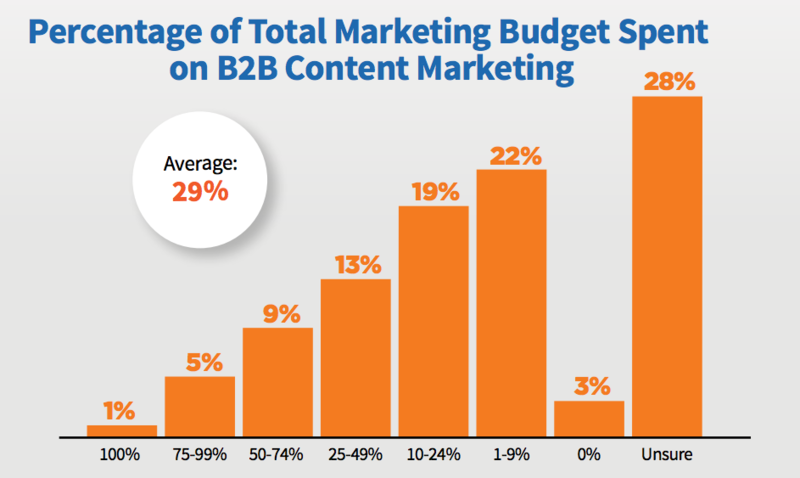 If you're not sure your content marketing strategy is solid enough to reach the results in this chart or if you don't think your current strategy validates spending the figures that other businesses are spending, then perhaps you should review and consider updating your content marketing strategy.